'An evenhanded, realistic and thoughtful approach to identifying environmental problems and management goals' Stephen Zavestoski, Assistant Professor of Sociology and Environmental Studies, University of San Francisco '…a theoretically advanced yet accessible treatment of environmental governance, drawing on an impressive range of material to investigate the roles of states and industries in addressing environmental problems.' Harriet Bulkeley, Department of Geography, University of Durham 'Written in the vein of critical optimism, this book is pitched at the right level to inspire people trying to make pragmatic changes to their governmental and industrial systems: trying to make a difference where it counts.' Timothy Doyle, Associate Professor in Geographical and Environmental Studies, University of Adelaide What is the future for our environment? We face serious risks of major industrial accidents and global environmental degradation, yet new technological developments promise a standard of living unimaginable only a few generations ago. 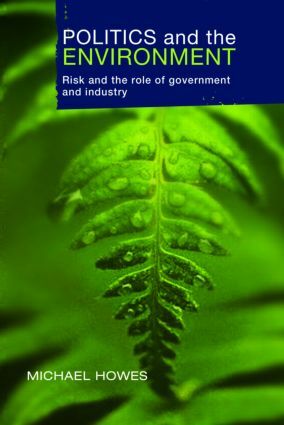 Michael Howes outlines the ways in which governments have responded to environmental risk over the past four decades. He examines the key environmental issues and the claims of envirosceptics, offering a new strategy for making major administrative decisions in the face of uncertainty. He explains how governments have developed environmental policy, and the ongoing tensions between science, industry, the state, social movements, and electoral politics. In a clear, straightforward manner, he shows how to use the work of theorists Ulrich Beck, Michel Foucault and John Dryzek to analyse environmental policy. He also develops a new method of measuring the effectiveness of environmental governance in developed countries. Howes draws on a wide array of sources from business, government, environment groups, academic research, and NGOs to illustrate his arguments, with comparisons between the environmental policies of the UK, the USA and Australia. Part A What’s the problem? Part B How has government responded? Part C Has it worked? Has industry changed the way it operates?